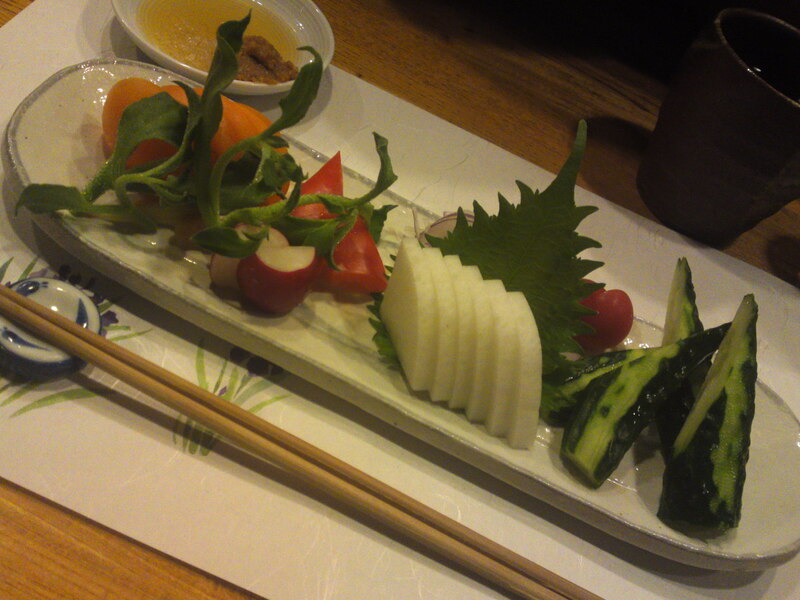 Vegan Sashimi at Yasaitei in Shizuoka City (April 2012)! 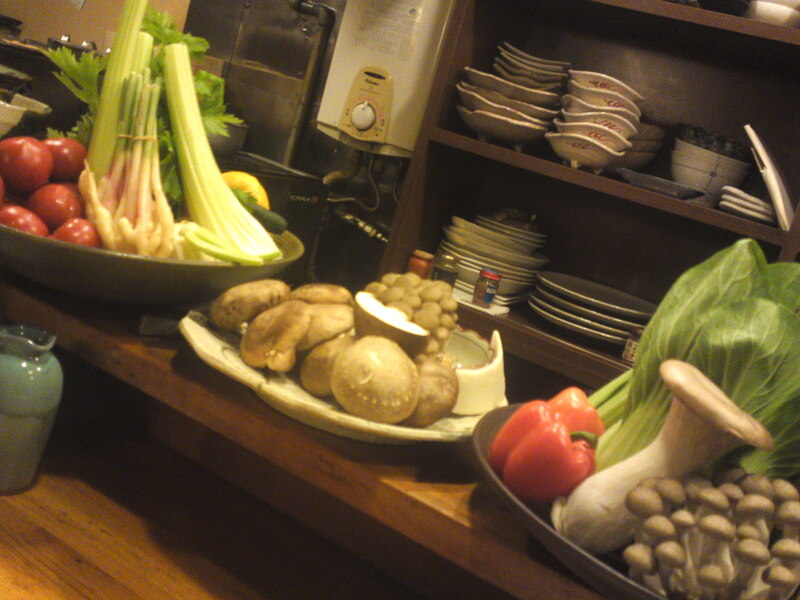 Specialties: Vegan and vegetarian Cuisine, Izakaya gastronomy, local products, oden. Good list of sake, shochu. Wines also available. With the warm days coming quickly one is always in search of refreshing food and drinks. 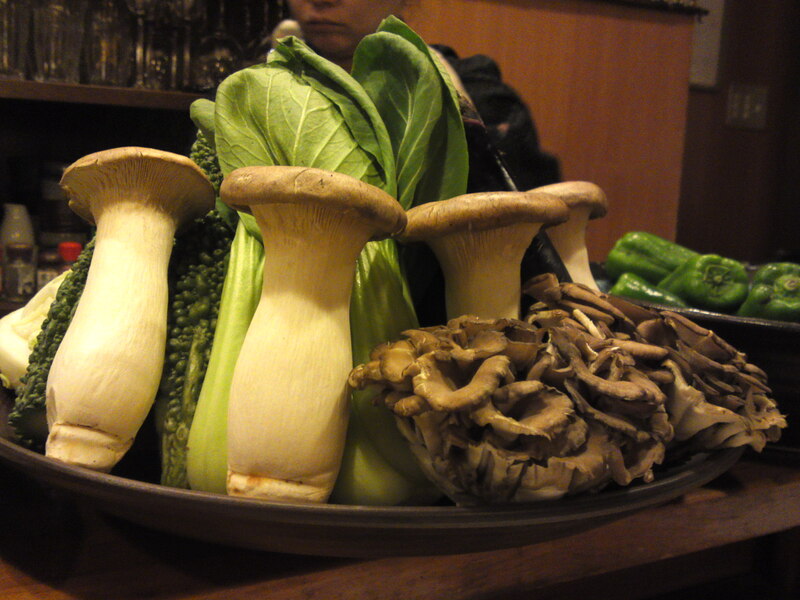 Fortunately in Shizuoka City this is not a problem at all with the abundance of vegetables! 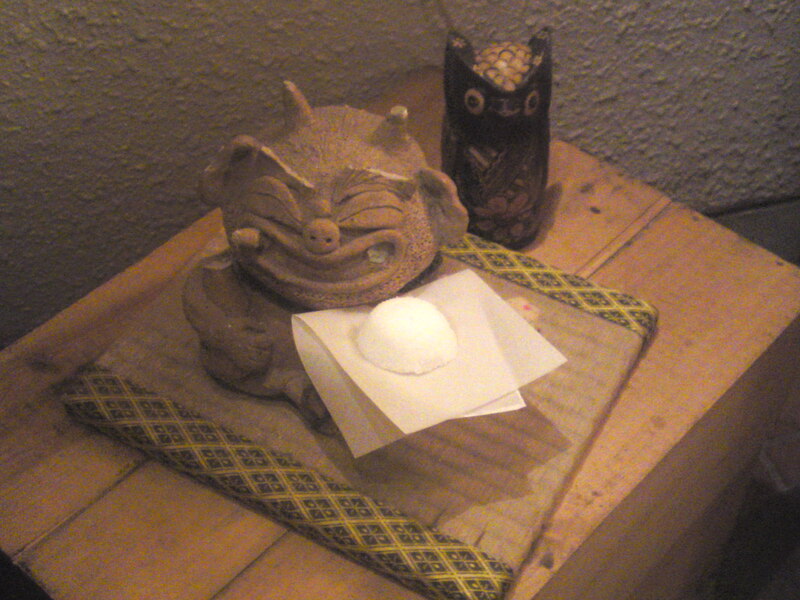 Yasaitei, like many izakayas in Japan, puts salt in front of their entrance to ward off evil spirits. They even asked a oni/goblin to look after them! A single look at the counter will let you know you have entered vegan and vegetarian heaven although the food is designed for all tastes and priorities! 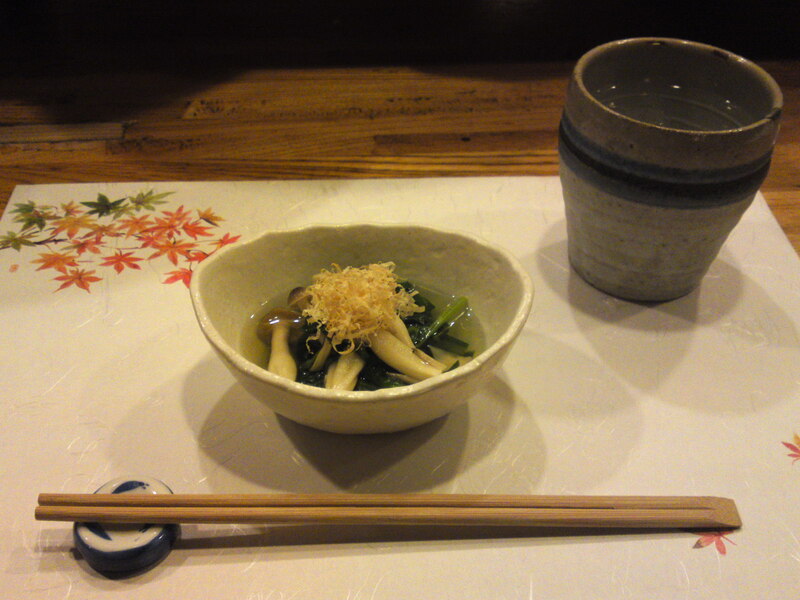 Although you might have to check the dashi, the first snack coming with my shochu (shochu is vegan by the way!)! People with special priorities will appreciate! 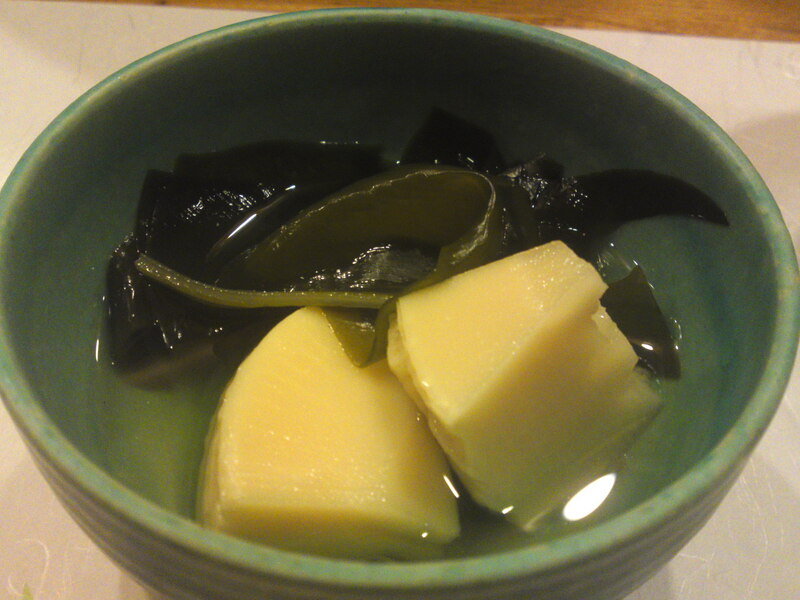 Thick boiled wakame seaweed and new bamboo shoots o-hitashi/japanese-style appetizer! 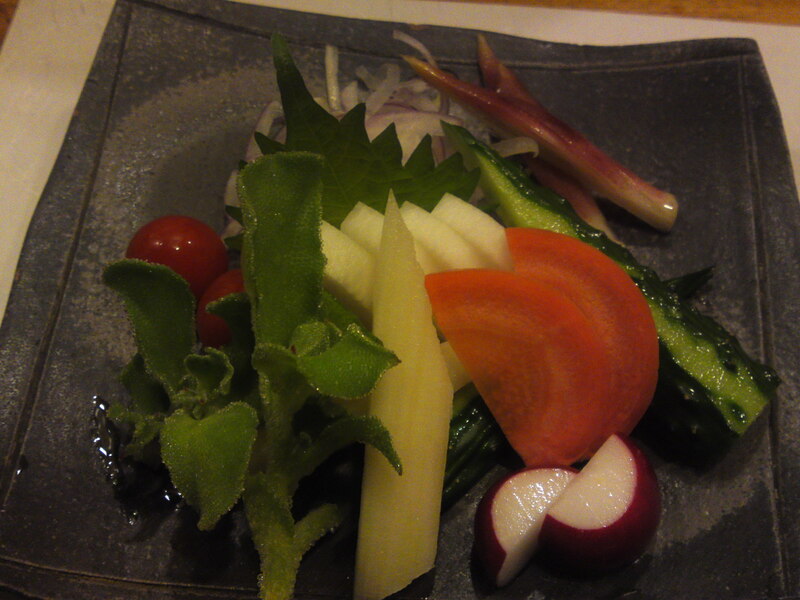 The main attraction of the day: Vegan Sashimi Plate conceived with local vegetables! 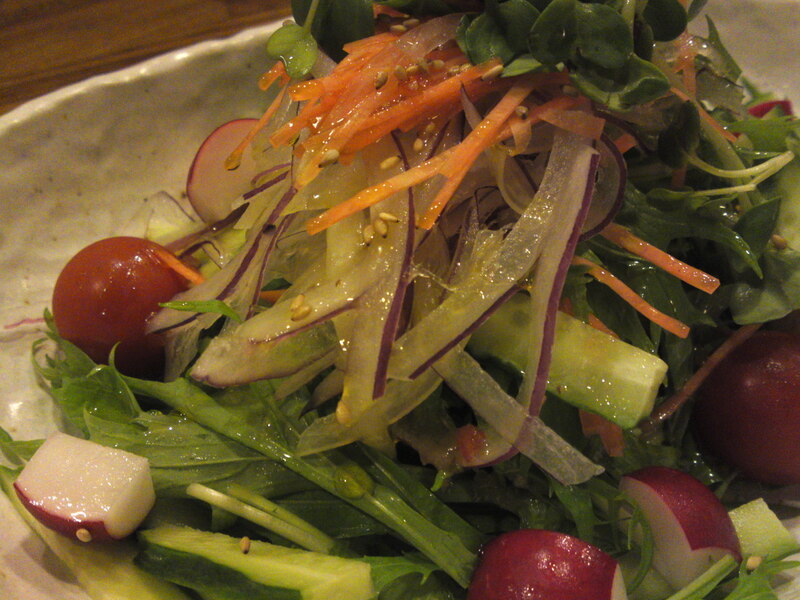 The dressing is made of sesame oil, salt and red miso paste only, so no problems! Now what did the plate consist of? “Cindy” orange tomatoes (very sweet) and ice plant. 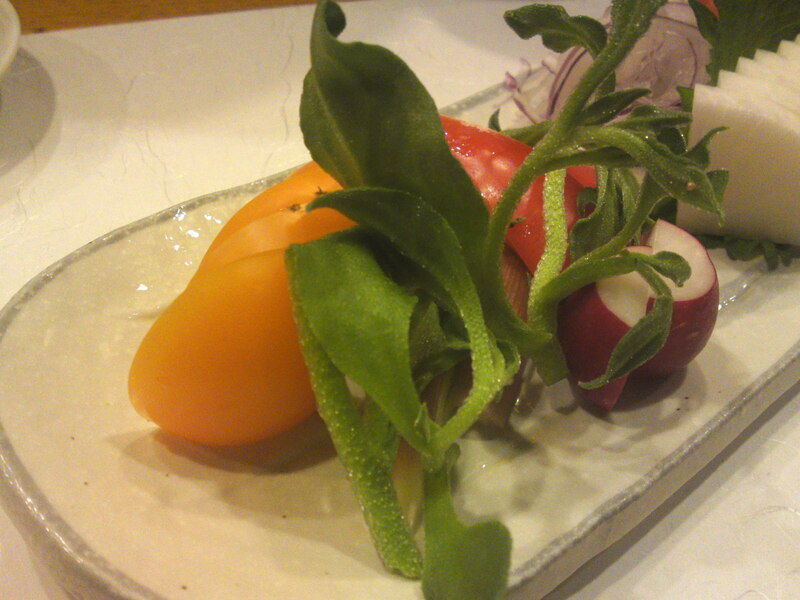 Small red radish and red pimento. 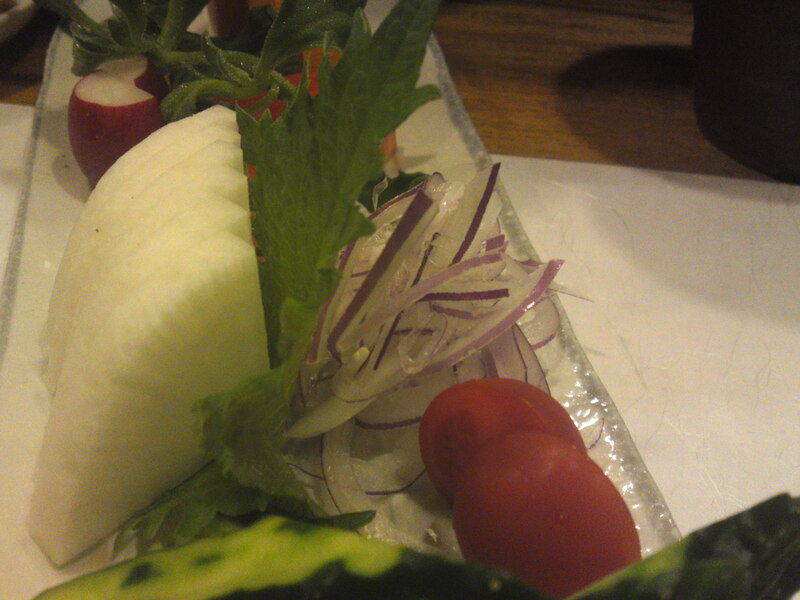 Juicy and mild daikon on shiso leaves. 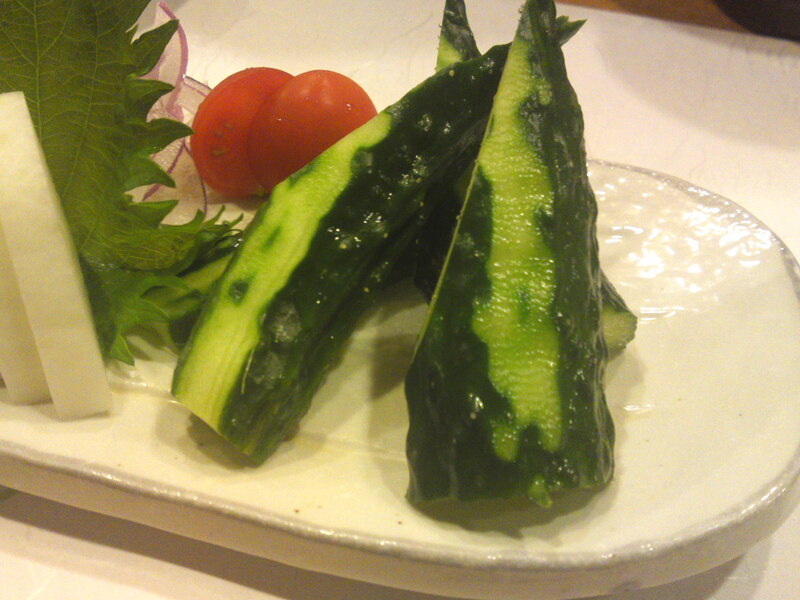 Crunchy and juicy cucumber and mini tomatoes. And finally chopped red onion giving support! 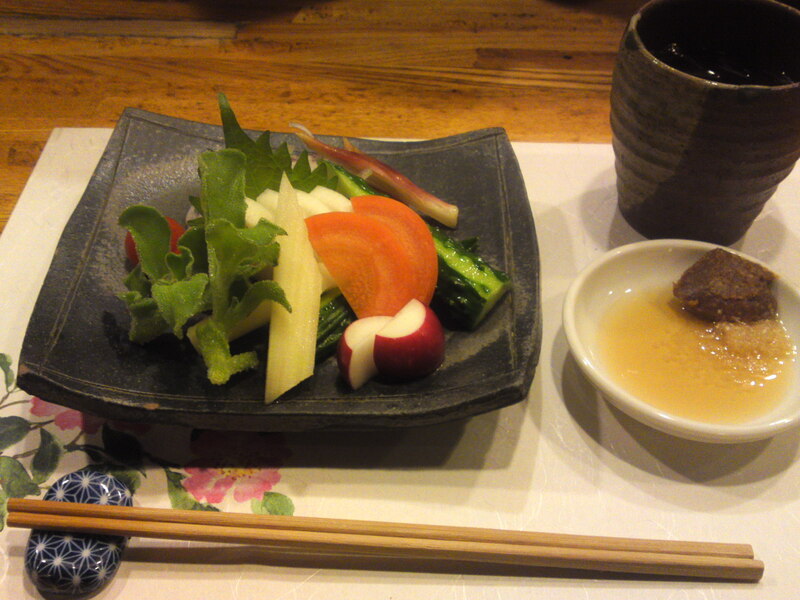 Vegetables Gastronomy at Yasaitei in Shizuoka City (November 2011)! 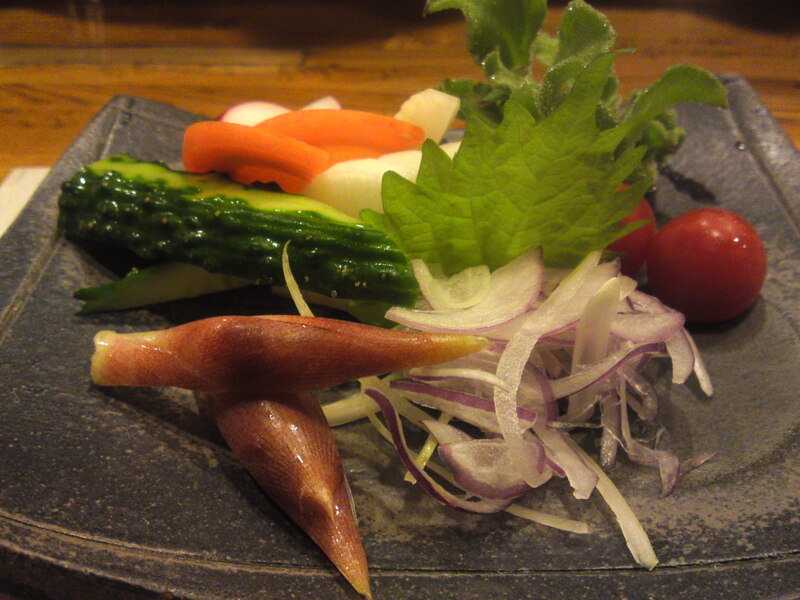 If your first interest is vegetables, especially local, and your second interest Shizuoka, there is only one place you may visit: Yasaitei! The whole lady staff in traditional dress will kindly prepare and serve you vegetables in all manners and according to your priorities, be they vegan, vegetarian or omnivore! To help me convince you here is a photography and explanation report I took last night in the company of a friend! I kept it on purpose to vegetables only (incidentally I’m an omnivore but I do appreciate any priority!)! A light snack is always brought with your first drink. Both of us had shochu, a vegan drink par excellence! 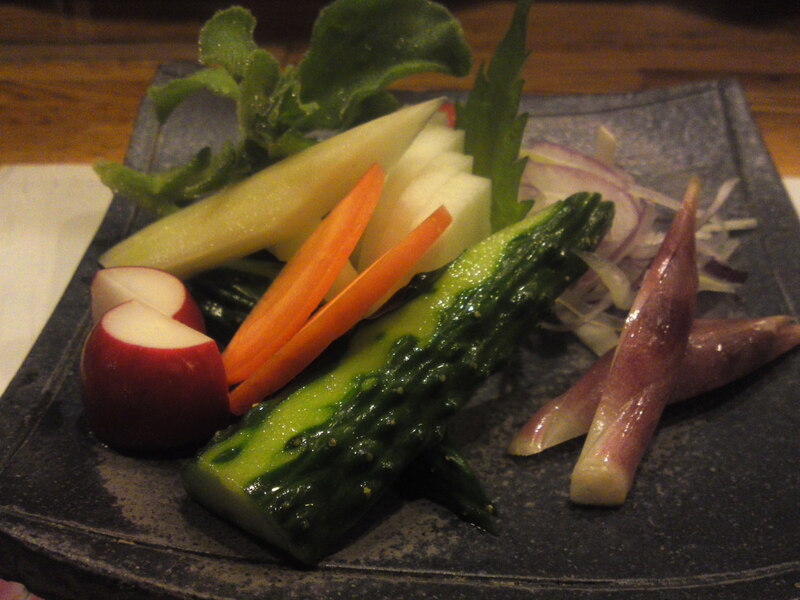 The light appetizers consisted of “o-hitashi”, a very simple and healthy way to prepare small vegetables typical of Japanese gastronomy. 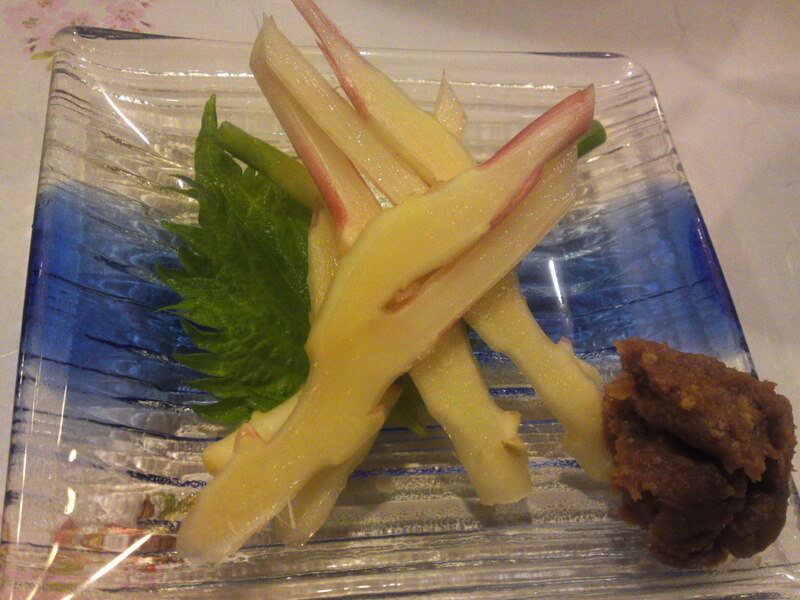 Make sure to tell you do not want the katsuobushi if you are vegetarian! As for dashi, if you do not want anything cooked in fish-based dashi, just tell the ladies beforehand and they will adapt accordingly! For a closer view of the “o-hitashi”! 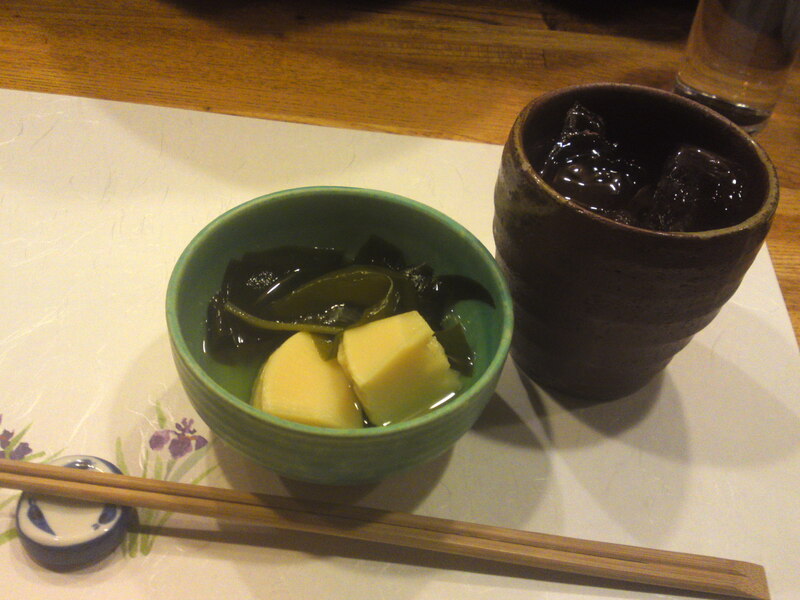 My friend had a similar offering with her shochu! Can you see the tofu karaage? 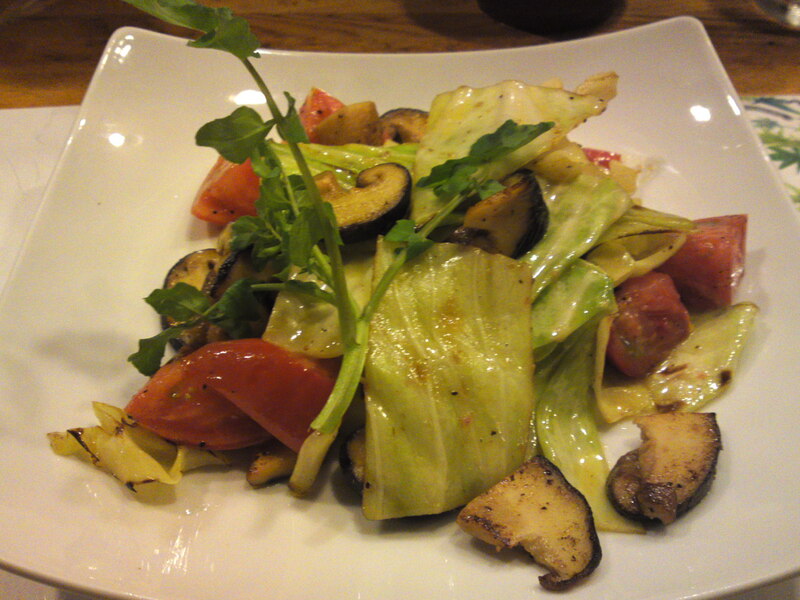 for the two vegetable main dishes of the night we first asked the Chef, Ms. Aki Suzuki/鈴木朋さん to concoct us a “European-style” salad with her own olive oil dressing! Can you see the golden sesame seeds for extra taste? 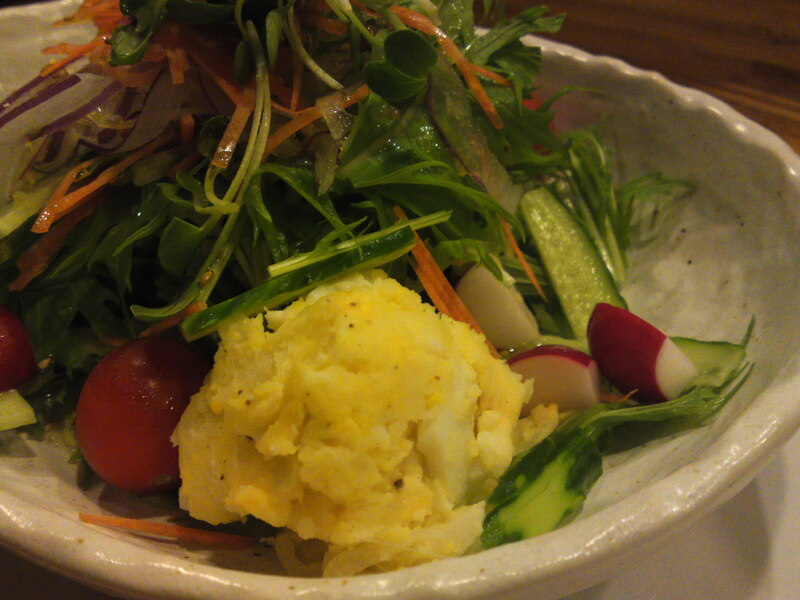 Healthy potato salad to help satisfy your hunger! 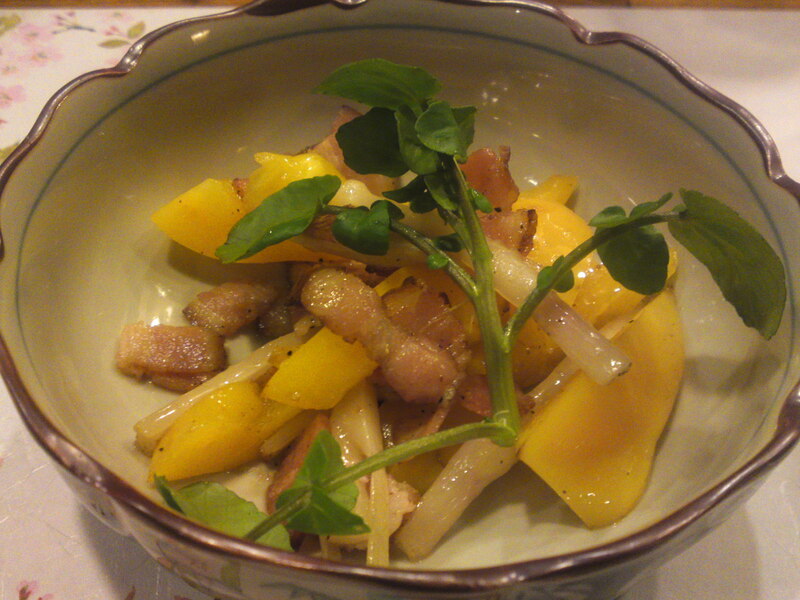 “Mukago”, a truly seasonal vegetable delicacy! These are the aerial seeds (no flowers) growing directly on the vines of Yama Imo/Japanese yams! 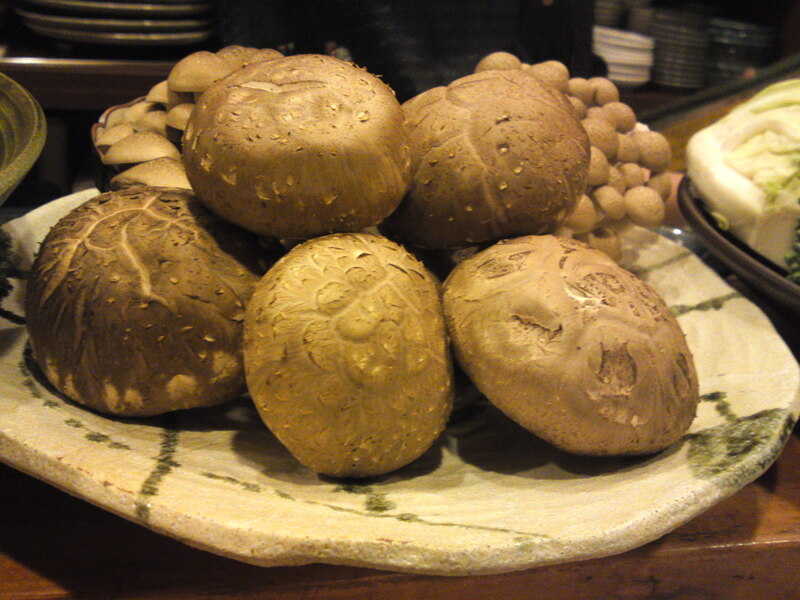 You can eat them steamed, stir-fried, deep-fried or stewed! The spoon to give you an idea of the size is a coffee spoon! 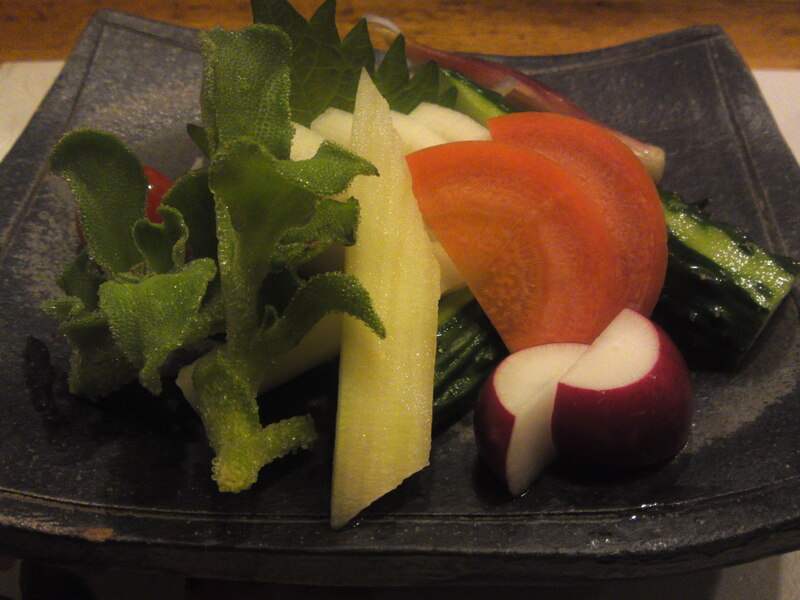 As for the second main vegetable dish we asked for the specialty of the house, Vegetables Sashimi (vegans, rejoice!)! Let me show it again from different angles to discover the design! 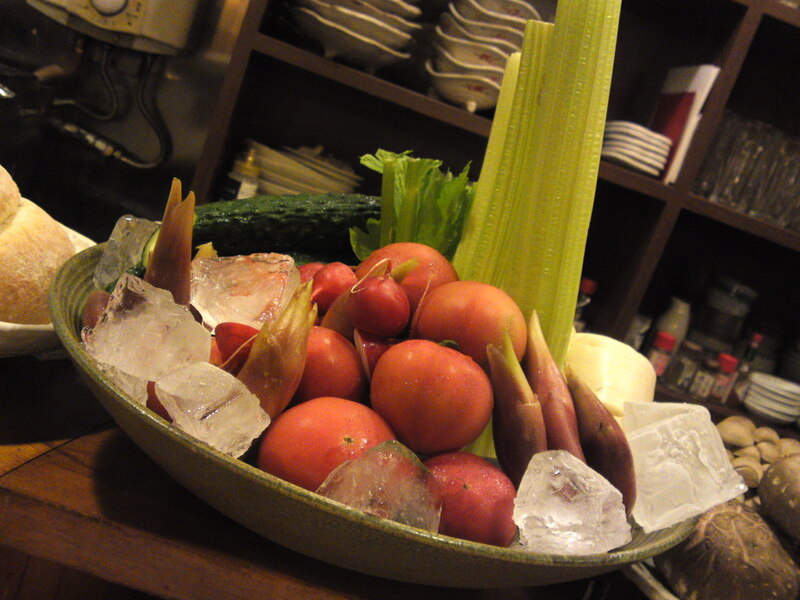 Red onion, daikon, tomato, ice plant! 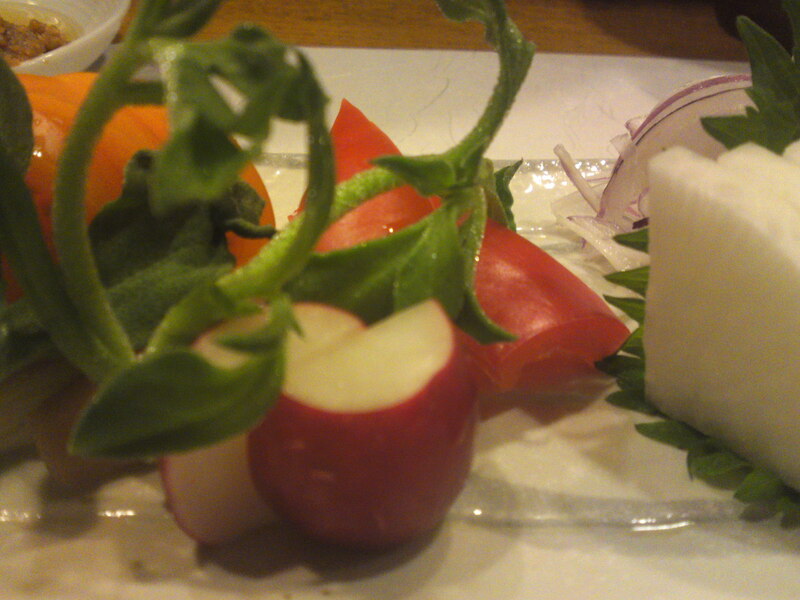 Radish, carrot, cucumber, myoga ginger. 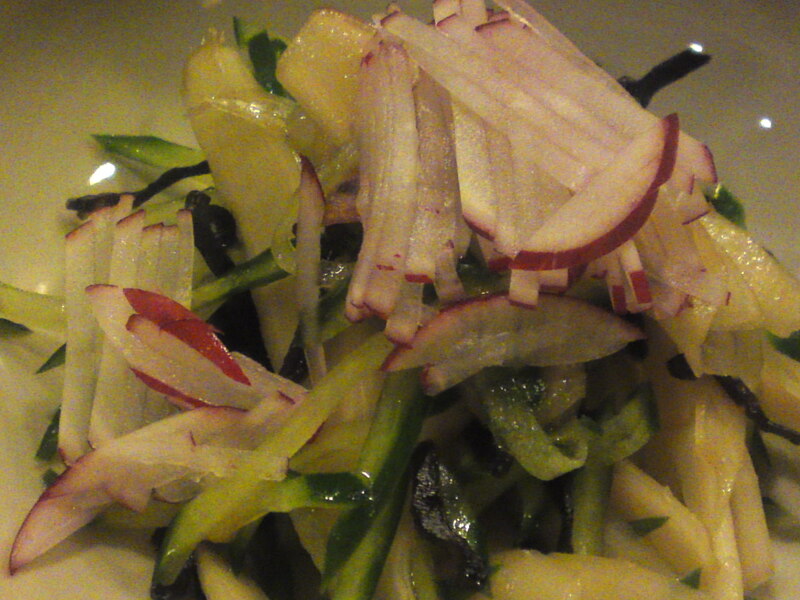 Ice plant, celery, daikon, shiso, red onion. 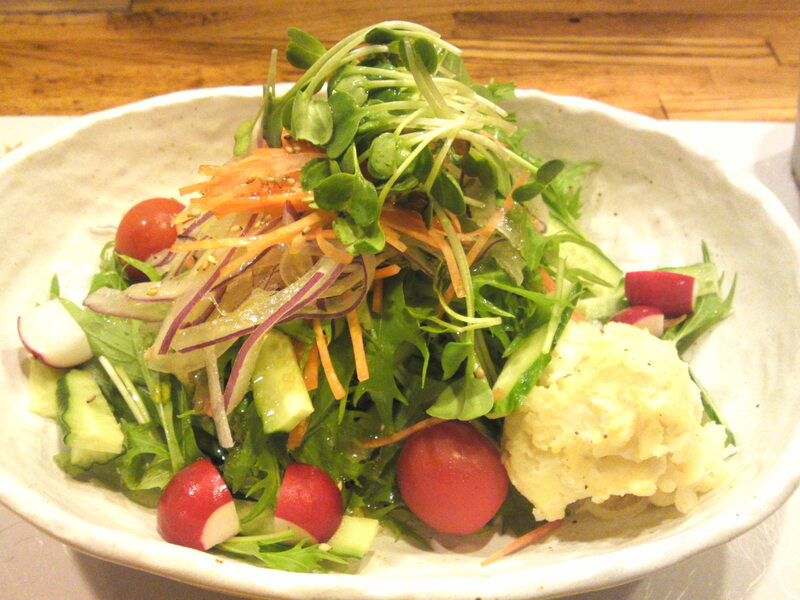 Vegan’s Paradise in Shizuoka: Yasaitei! Facilities: Very clean overall. Superb toilets. 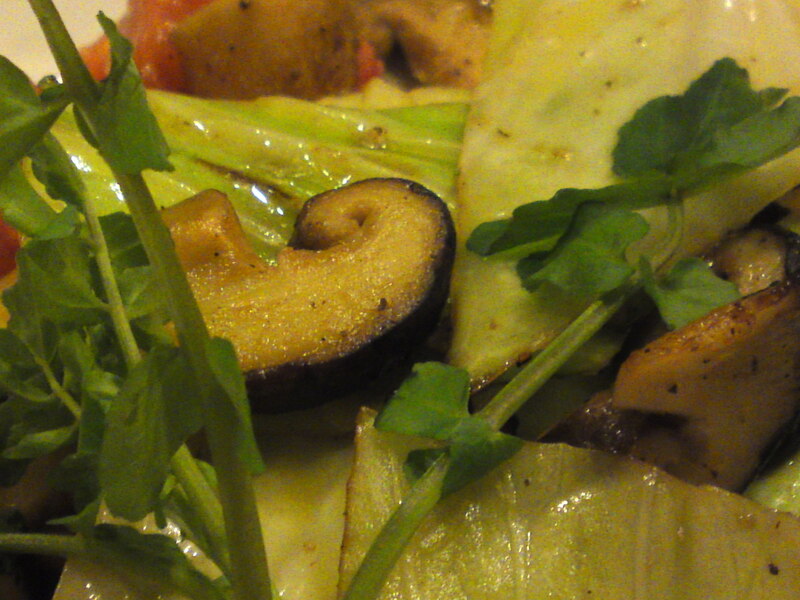 Strong points: Great choice of local & Japanese vegetables. 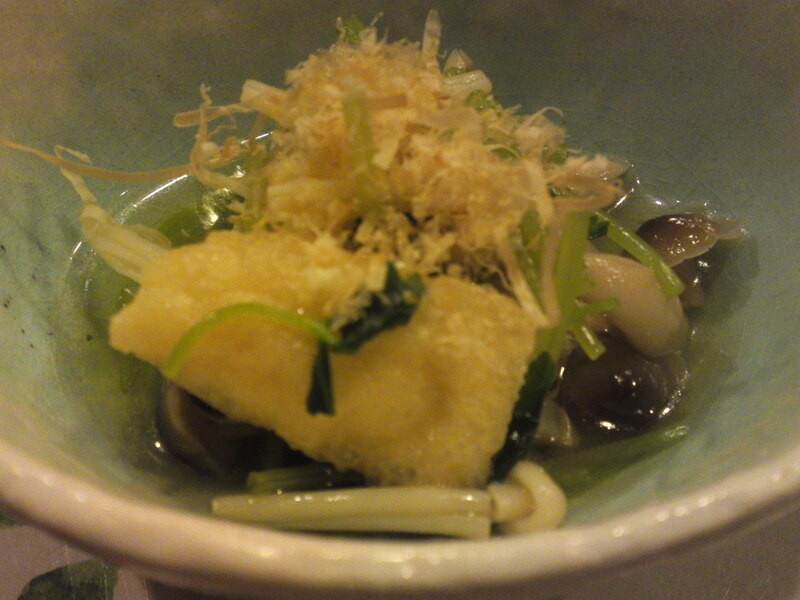 Kansai-style oden. 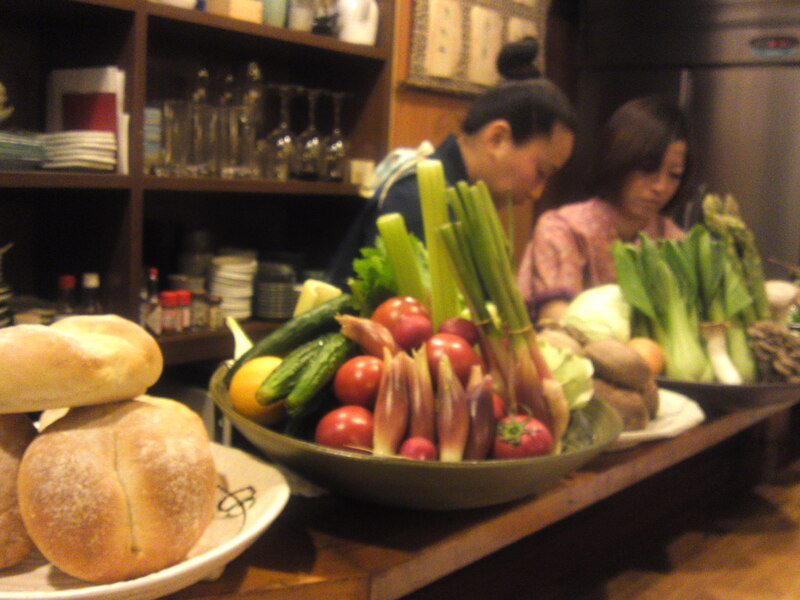 All traditional ladies staff in tradtional izakaya. Good wines, shochu and sake List. 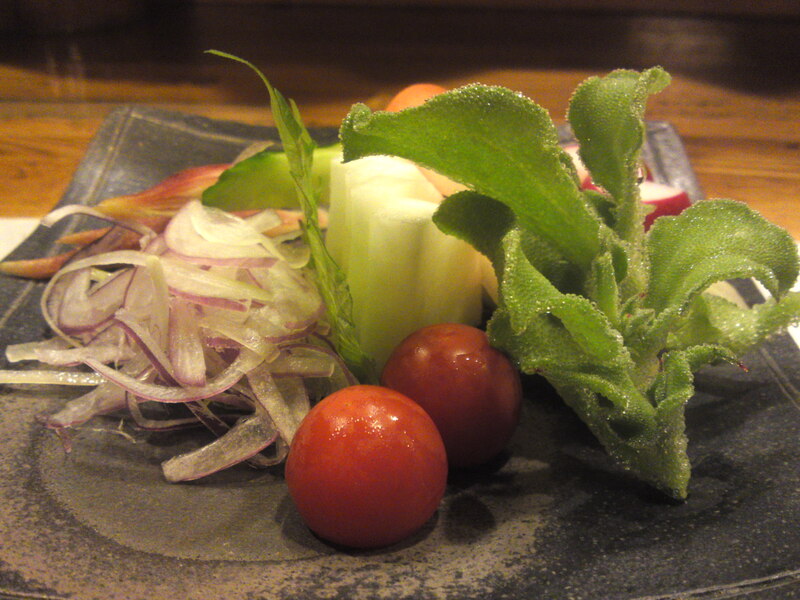 Spring is a boon for an izakaya like Yasaitei which specializes in vegetable cuisine (although you can get anything from fish to meat). 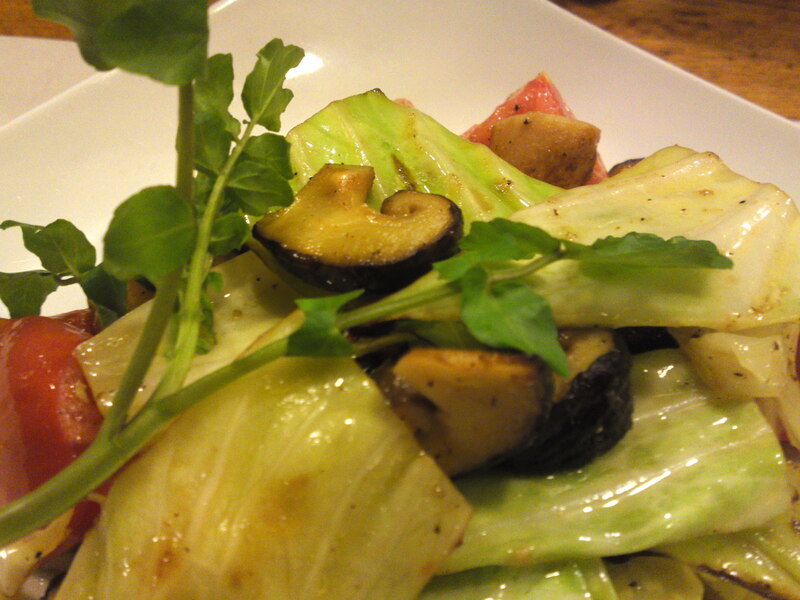 Although I’m not, it is always great fun to ask for vegan or vegetarian dishes to Ms. Aki Suzuki/鈴木朋, chef at Yasaitei. I will let you guess them out (mind you, it is not too difficult!)! While I was teasing Aki San I was brought my snack with my first drink. 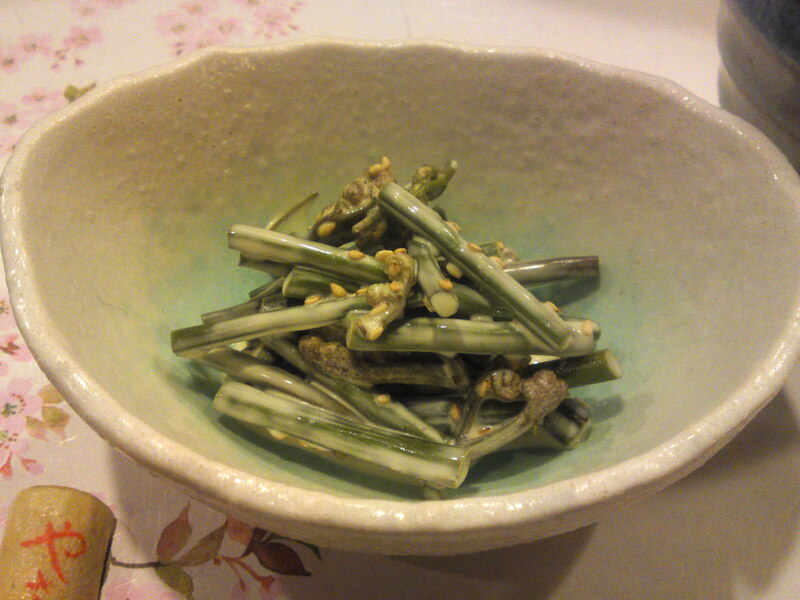 This seaweed is called “mekabu/和布蕪”. 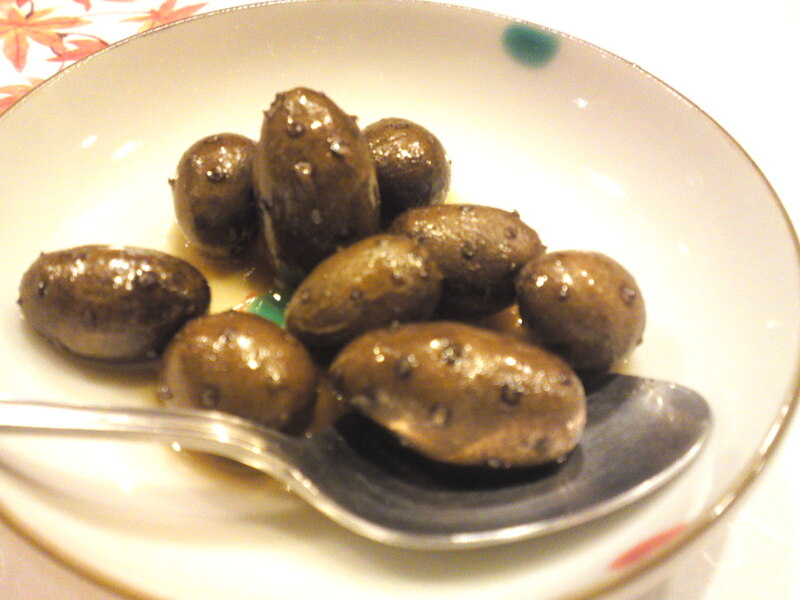 It is found in the shape of balls in the nearby sea and has to be chopped first before serving it with some ponzu and sesame seeds. It is said to be extremely healthy, full of nutrients and especially beneficial to humans! 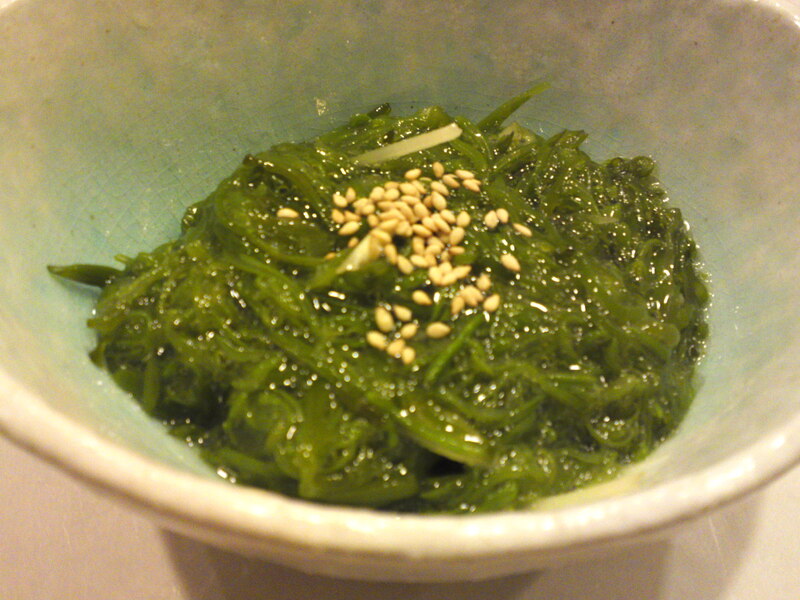 After all, seaweed is the vegetable of the ocean! 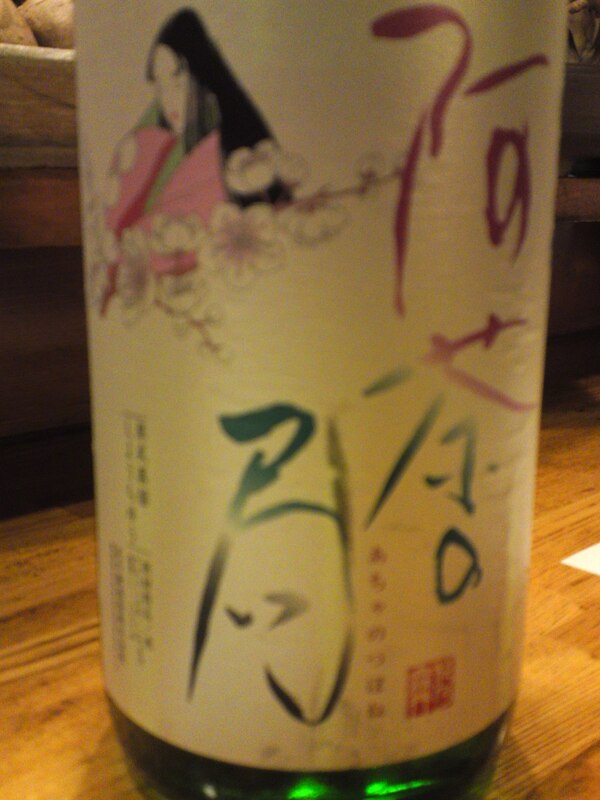 As for my drink I chose a rice shochu, brewed by Hana no Mai Brewery in Hamamatsu City, called Acho no Tsubome. Incidentally, this shochu is vegan! And the art so cute! I was not here for a full dinner but for a quick snack before going back to work. 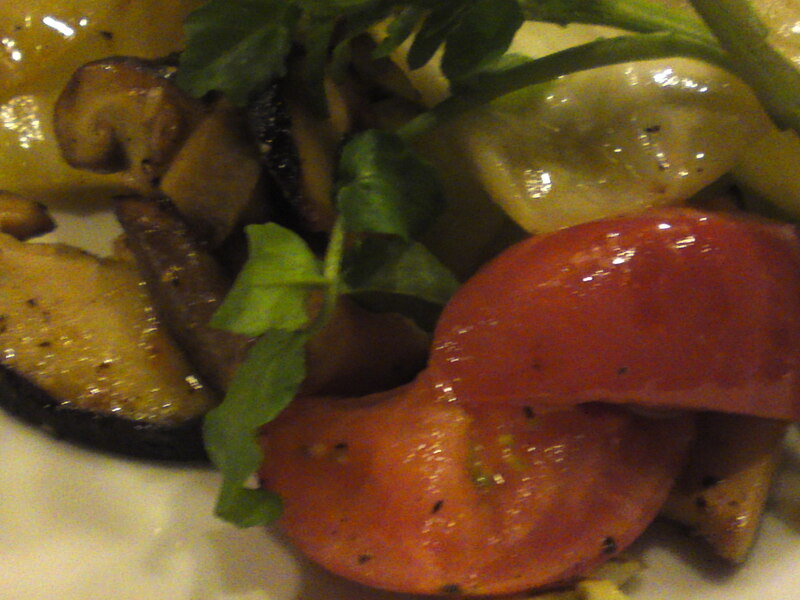 So Aki san fried shiitake mushrooms, tomatoes and plenty of Spring cabbage in peperocino style and served them decorated with local fresh cress. For such cuisine Aki San will use only absolutely top-class Italian virgin olive oil and a minimum of seasoning, mainly salt, pepper and chili so as to preserve the true taste of the vegetables. Let me show you some closer shots for a better look! From the top, a little bit closer. 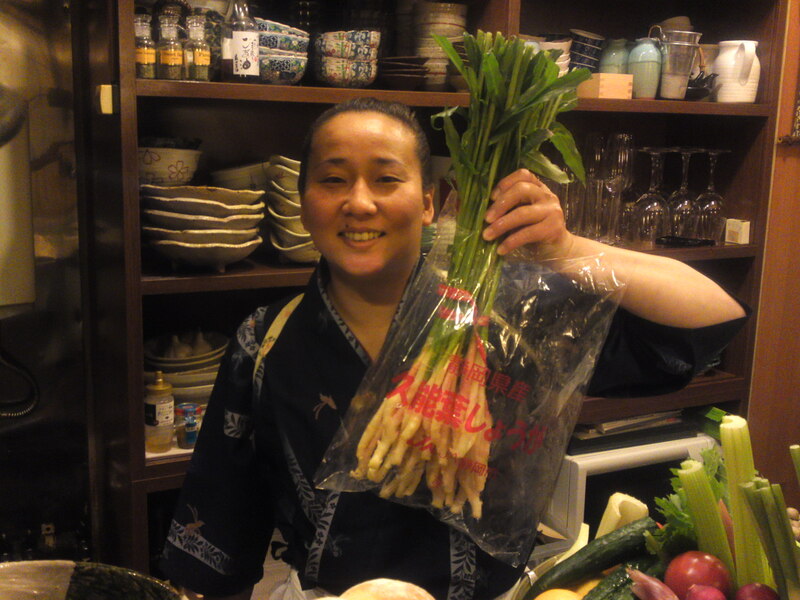 Although she cooks all kinds of dishes, including omnivore, Aki San will be glad to oblige and devise strictly vegan or vegetarian dishes for you and even a full meal if requested at least a day in advance! Warren Bobrow, Bread + Butter, Zoy Zhang, Hungry Neko, Think Twice, Frank Fariello, Mangantayon, Hapabento, Elinluv Tidbit Corner, Tokyo Terrace, Maison de Christina, Chrys Niles,Lexi, Culinary Musings, Wheeling Gourmet, Comestiblog, Chronicles Of A Curious Cook, Tokyo Through The Drinking Glass, Tokyo Foodcast, Palate To Pen, Yellin Yakimono Gallery, Tokyo Terrace, Hilah Cooking, More than a Mount Full, Arkonite Bento, Happy Little Bento; 5 Star Foodie; Jefferson’s Table; Oyster Culture; Gourmet Fury; Island Vittles; Good Beer & Country Boys; Rubber Slippers In Italy; Color Food daidokoro/Osaka;/a; The Witchy Kitchen; Citron Et Vanille, Lunsj Med Buffet/Estonian Gastronomy (English), Cook, Eat, Play, Repeat, Chrisoscope, Agrigraph, The Agriculture Portal to shizuoka! 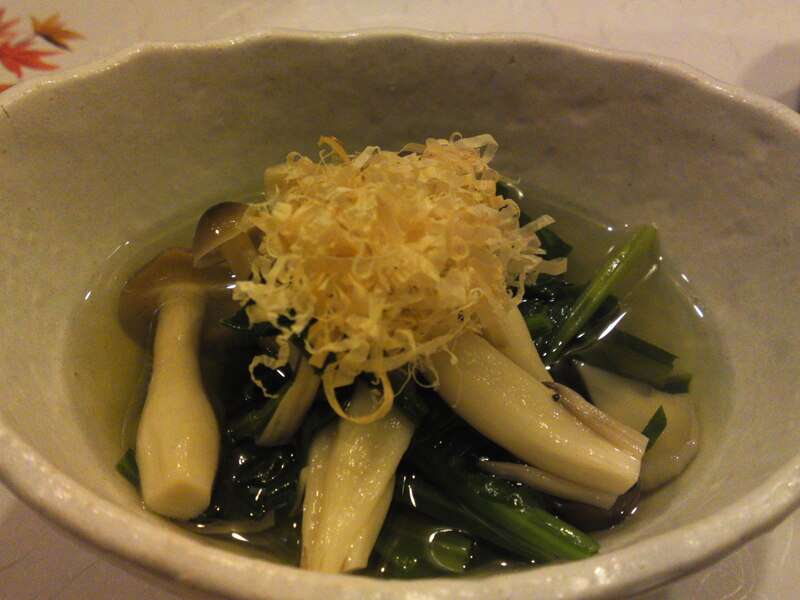 Shizuoka Agricultural Products: Hatada Garden Leaf Ginger at Yasaitei! 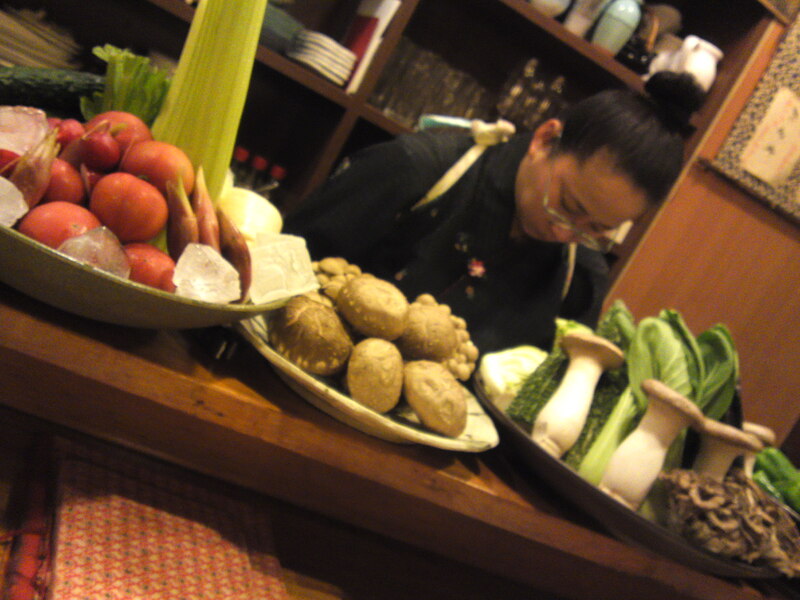 Ms. Aki Suzuki/鈴木朋, chef at Yasaitei. I said in my previous article that there are many Shizuoka products worthwhile introducing not only to the general public but also to restaurants who work hard promoting food originating from our Prefecture. 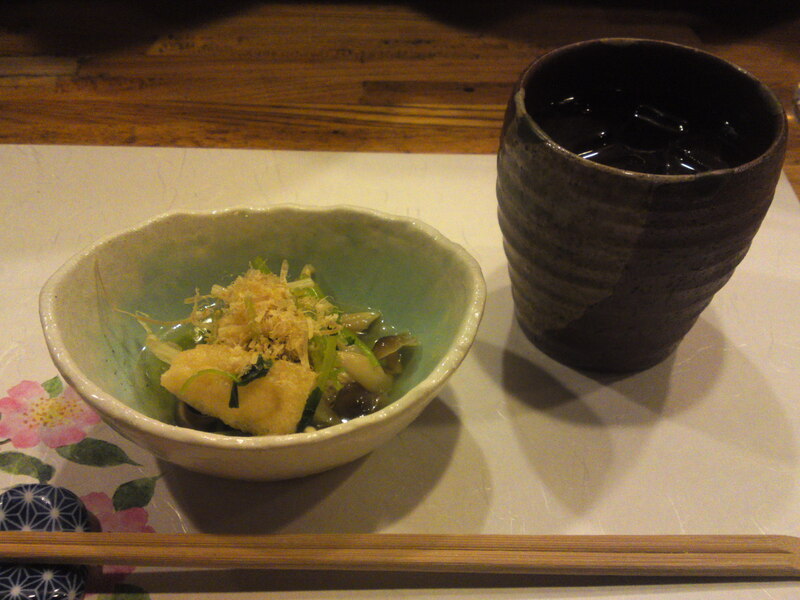 Another such place is Yasaitei in Shizuoka City! 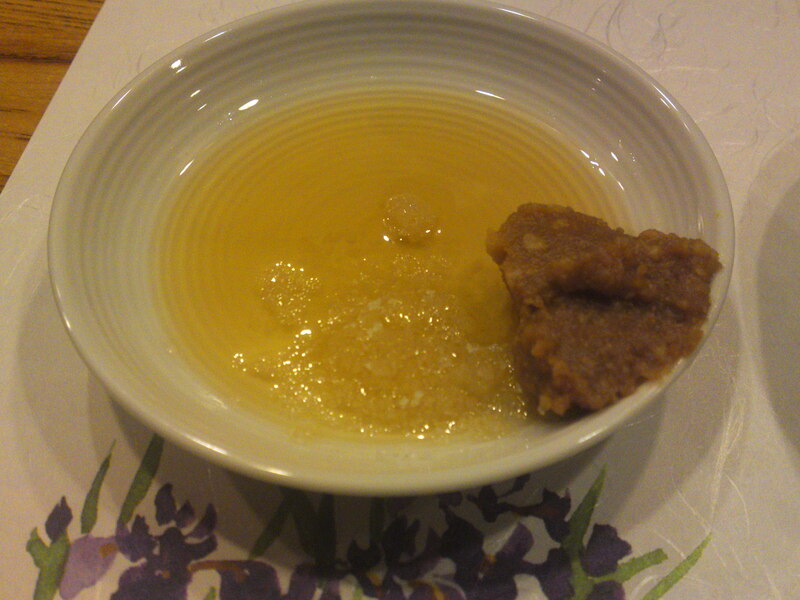 Like in the other article, after having interviewed Toshikatsu Hatada/畑田敏克 at Hatada Garden/畑田農園 in Kuno/久能 in Shizuoka City, I called Ms. Suzuki to tell her I was bringing fresh leaf ginger and I wished her to create some dishes with it to which se immediately genially agreed! Yasatei thus the second restaurant I visited on that day! 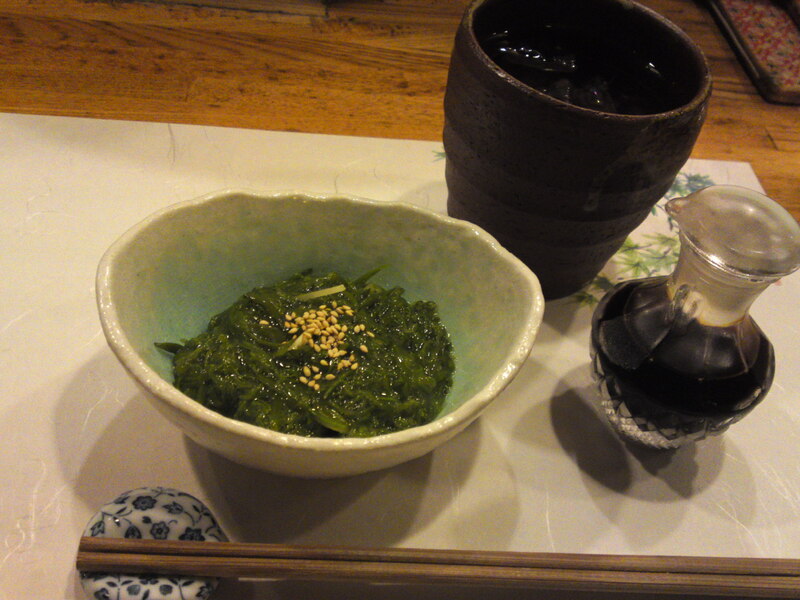 I had my usual (I’m a regular there, too…) glass of Doman Shochu (brewed by Hamamatsu-Tenjingura Brewery in Hamamatsu City) with a snack consisting of kogomi/こごみ/ostrich fern in sesame dressing. 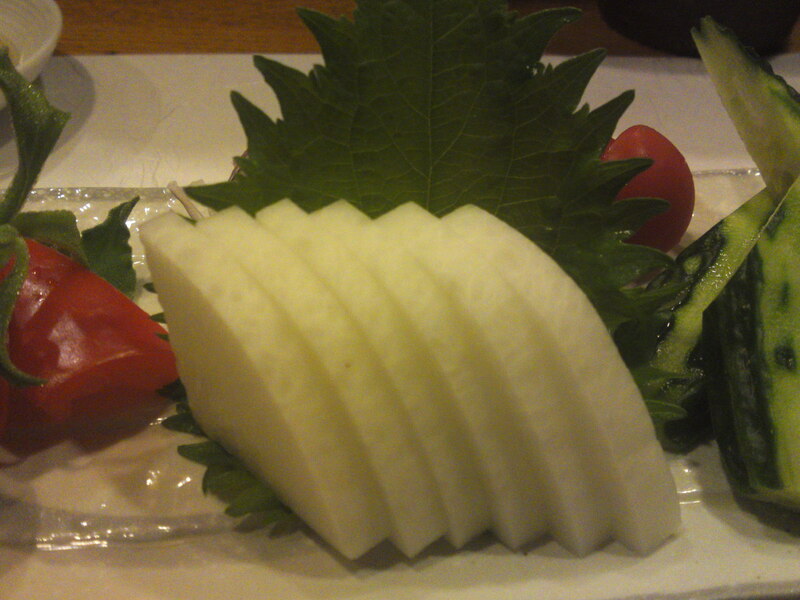 Aki keeps things simple with a respect for the natural taste of ingredients. 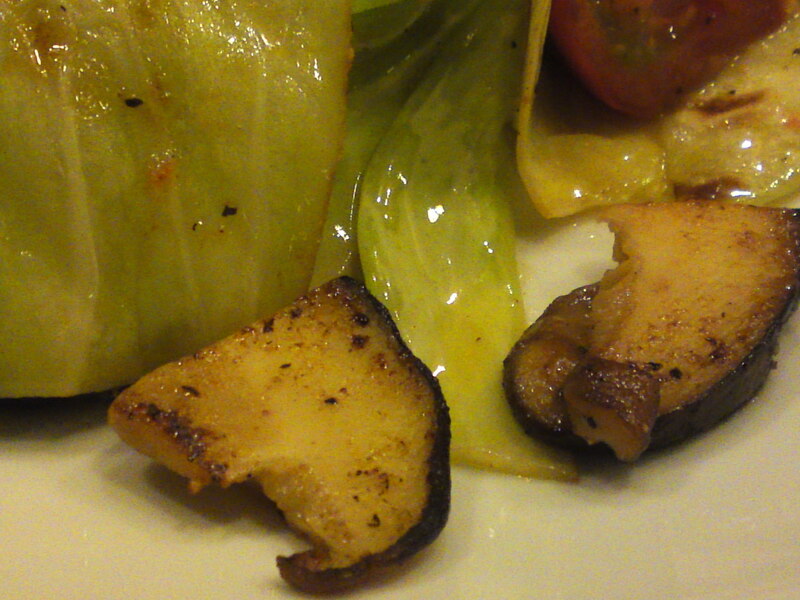 The first serving was the leaf ginger cut and served with red miso paste. 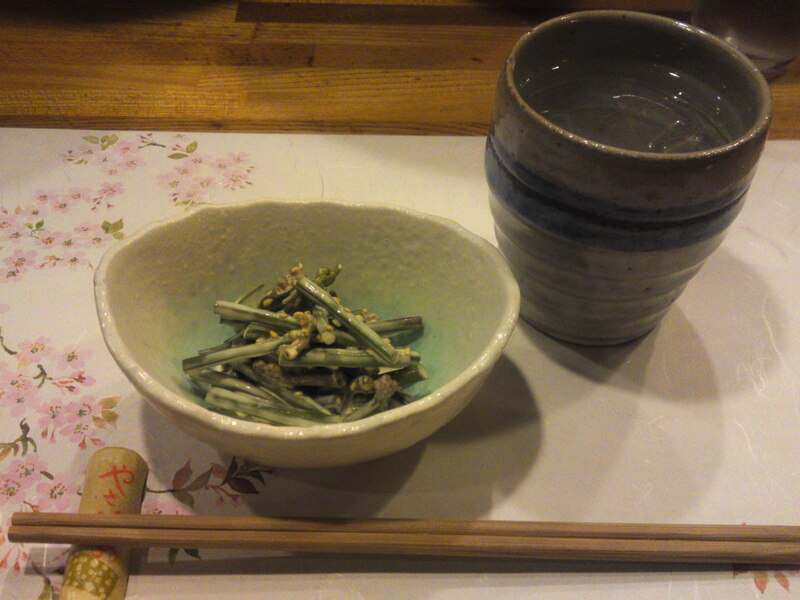 A great snack for the shochu! Keeping in mind I wanted something light to accompany the drink, she lightly fried in olive oil and a minimum of salt and pepper thin strips of leaf ginger, bacon and strips of yellow sweet pimentoes. 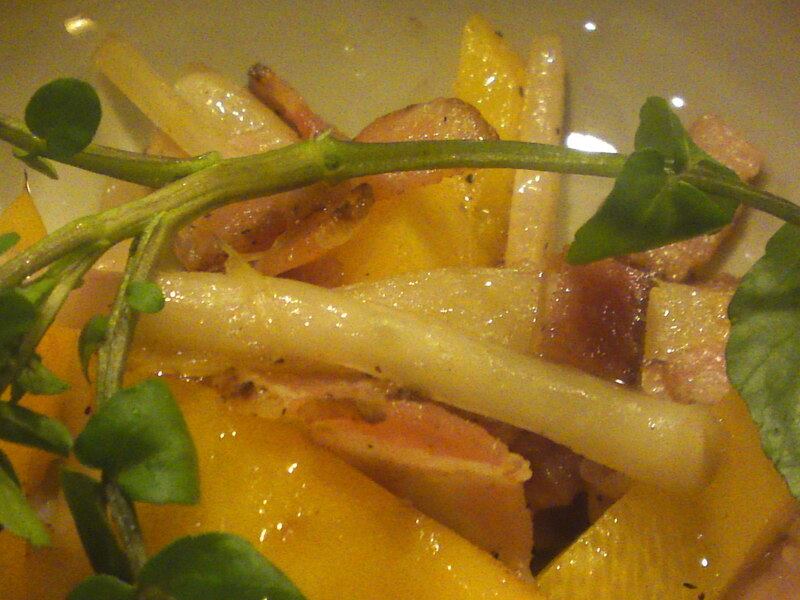 Great balance between the salty taste of bacon, the sweetness of pimentoes and spiciness of the ginger! 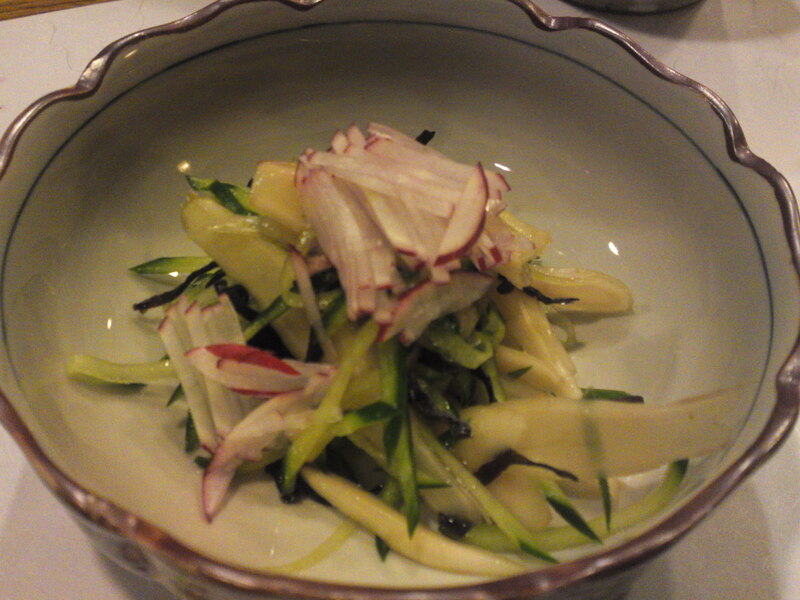 A salad of very lightly fried strips of leaf ginger and cucumber topped with thin strips of raw radishes for an interesting and slightly piquant salad!